Express Catering From 20 to 100 pax. In order to cater for small parties, functions in a quick set up, it is best to order from Fifth Season. We take pride in our quality and taste. 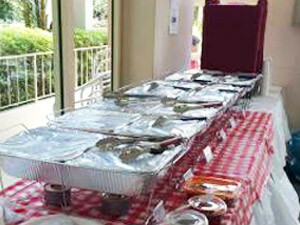 Minimum number for Express Catering order is 20 (pax) persons. Any order below 20 pax may be considered for Bulk Take Away package with a request for delivery. Any order above 50 pax may also look at our Premium Catering Package. For food order please consider 2 children aged between 5 years to 10 years of age as one and children above 10 years as adult. Number of Vegetarian and non vegetarian guests should be stated clearly to avoid shortfalls/wastage. For service staff on site we can provide at an additional rate of $60 for four hours. The staff should be released latest by 10.30 pm. For delays, additional rate of $15/- per hour will be applicable and it is requested to reimburse taxi fare to the staff to return home. Proceed to pay 50% of the cost of the catering plus all other charges plus 7% Gst to confirm the order. Balance of the payment, may be paid by cheque in favour of Asia Cuisine.com Pte Ltd, on the date of delivery on completion of the set up.